Week two of Transit Police Academy was very technical. Literally! It was all about the technology they use to communicate with each other, other police in the region, emergency services as well as you (and me! ), the riders on the system. Something I thought was particularly interesting is the way that Transit Police uses historical data and specialized crime predictive analysis to identify and track hotspots and areas of concern along the system. Specialized software automatically generates a predictive algorithm which enables Transit Police to forecast where and when criminal activity is most likely to occur. This information determines where police focus their patrols, greatly reduces response times and helps to proactively reduce and address root causes of crime. At the start of a patrol shift, officers check the operations dashboard to find out what’s been going on in the patrol area. The dashboard can be sorted by incident type and frequency and geographical location. The ability to discreetly report non-emergency police issues by texting 87-77-77 or using the OnDuty app is amazing! Sometimes we see things on and around the system and we’re not quite sure if it’s “call the police” worthy. If it is, we wonder if it will endanger or draw negative attention to us by reporting it by phone. 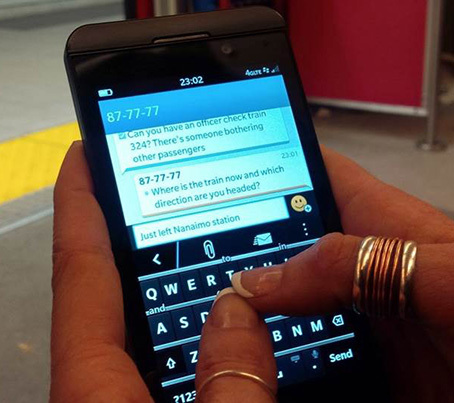 Using the 87-77-77 text line or OnDuty app, riders can discreetly report any non-emergency suspicious behavior such as: assault, vandalism, public drinking or anything else out of the ordinary that they encounter while on riding all modes of transit. When you report an issue, it goes directly to Transit Police Dispatch. 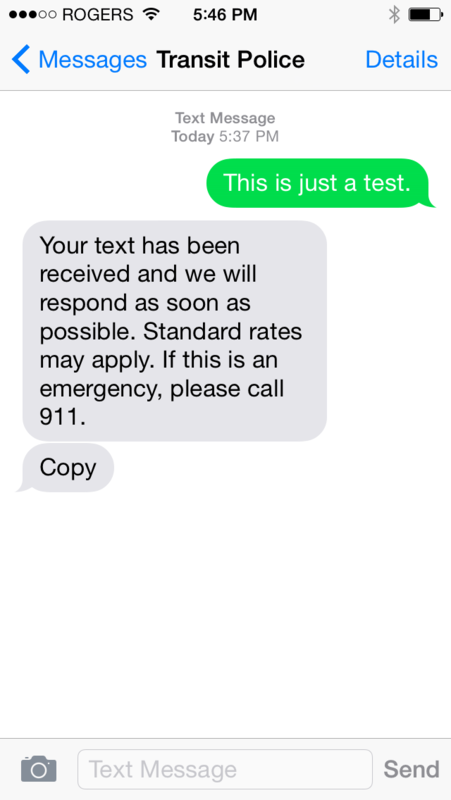 You will immediately get a bounce back text acknowledging its receipt and that they will respond ASAP. It also reminds you that if it’s an emergency, call 911. Then, they will try and communicate with you over the phone, if it is safe to do so, to get all the information as quickly as possible. There are only a few points on the system where you lose connectivity so this is pretty handy! The On Duty App is your one-stop-shop for Transit Police information. Not only can you use it to report police issues on transit, subscribers can stay connected to Transit Police news and information, social media channels, view crime hotspot maps and get alerts when there are major disruptions on the system. There are also links for Trip Planner, Next Bus and Crime Stoppers. There have been seventy-five hundred downloads since its launch last June. You can download the app for iPhone or Android. Transit Police proactively work with the public and use technology to make it easier for riders to contact them. Every report that Transit Police gets helps to make public transit even safer. You can find out more information about communicating with Transit Police here. Stay tuned, here on the Buzzer blog for my next installment in a week’s time. TransLink Twitter Customer Information team gets rave reviews! Transit has got you covered for the playoffs!